Have you just acquired a site for redevelopment? Often in such cases, old buildings need to be removed so you can begin your construction or redevelopment project. Demolition of buildings, no matter how small or tall is obviously fraught with hazards and surrounded by safety issues. This is where using Brokk demolition comes into its own. At National Drilling, we have the experience and expertise of working on a variety of sites from small local projects to major contracts with highly visible redevelopment plans, such as Terminal 2 at Manchester Airport, Liverpool One and a number of supermarket sites across the UK. With over 30 years in the industry, National Drilling is well established with a reputable UK capability, servicing major contractors on a daily basis. 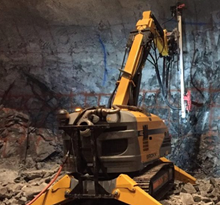 We own a Brokk 100 robotic demolition machine, which boasts 35% more hitting power than other demolition machines. These are the reasons why we are in a strong position to support your demolition project using Brokk demolition. See our web page on Brokk demolition for more information. Brokk demolition is a tried and tested demolition method using a machine rather than a traditional wrecking ball. As each movement is controlled it is much safer and easier to predict where debris may fall. Using Brokk demolition means you have a tighter control over safety as well as precision and in fact efficiency. 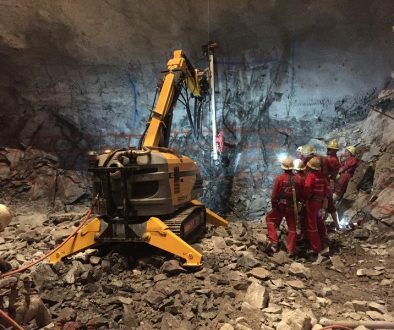 Assuming access is appropriate, which it usually is as the Brokk machine is relatively small, this type of demolition can be used for the vast majority of demolition jobs. 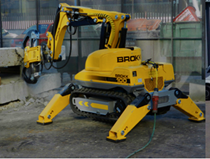 The design of the Brokk demolition unit makes it stable even on uneven surfaces. You won’t believe where you can access with the Brokk demolition machine! You will probably be surprised by just how small and compact the Brokk demolition machine is, yet how energy efficient and powerful it can be. This results in many additional benefits, from facilitating transportation from site to site on a standard lorry, to even enabling it to fit into elevators or climb stairs! To find out more about how National Drilling can use Brokk demolition to facilitate your demolition project and help your redevelopment project get a kick start, call us on 0161 443 2822 or if you prefer you can email us and tell us all about your project plans and location at info@national-drilling.co.uk. We look forward to working with you. Looking for experts in diamond wire sawing? Why would you consider expansion joint sealing?